Málaga is a city with quite a bit of multicultural history due to their strategic position at a natural port. This port generated interest and desire from every nation that settled in Spain. Maybe, with no discredit to the beautiful art created by the Arabic people, is Christian culture the one that has ingrained there. 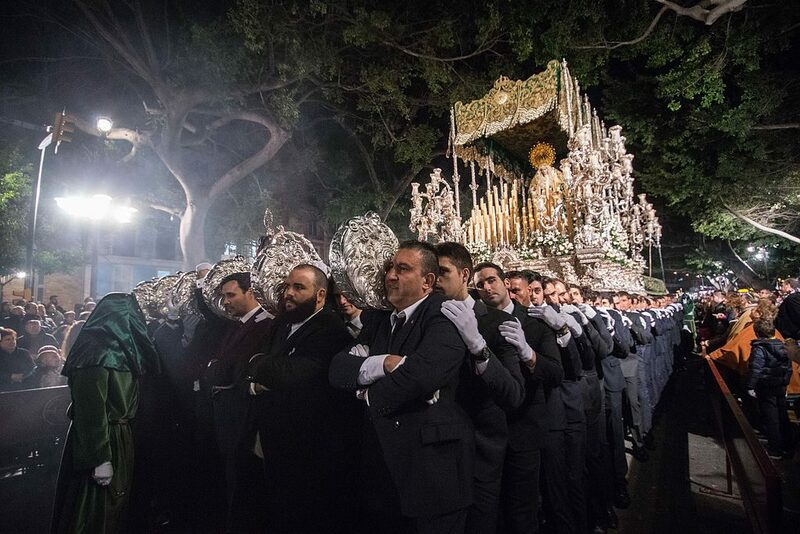 Proof are Málaga Easter processions, that were declared International Tourist Interest in 1980. 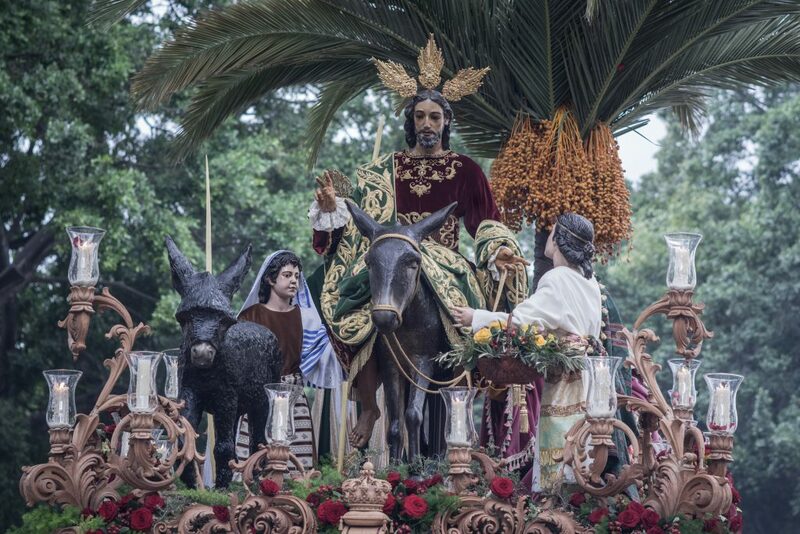 These Holy Week processions can be over 500 years old! Plus the great sight that they are, with their brimful thrones for Christ and the Virgin, that can be carried by around 250 people, they also have great social and cultural component for Málaga’s residents. Many citizens partake, either by carrying the throne or by becoming a penitent or for a promise. Something typical about these unique processions is that they are escorted by military force and the State security force, like “Guardia Civil”, “Legión”, Marines or even the Parachute Brigade. From Wiber we want you to live these holidays as if you were a local, hence we’re going to tell you everything that matters about Málaga’s Holy Week. Remember that we will be waiting for you at Málaga’s airport to share with you a wonderful #WiberExperience. When it’s Holy Week, Málaga is full of life: Málaga people engage in impromptu “saetas” (sacred songs), applause and “viva” (hurrah!) exclamations while processions occur. These parades happen from Palm Sunday to Good Friday, leaving Holy Saturday as a resting day until the resurrection of Jesus on Easter Sunday. Unlike other cities that also have Easter parades, in Málaga the sacred images are carried on “thrones”, quite bigger than the usual “pasos”, and are not carried by “costaleros” but by “men of the throne”, divided in butlers (that rise or lower the throne) and foremen (who place men arranged by height and give the orders to move forward). 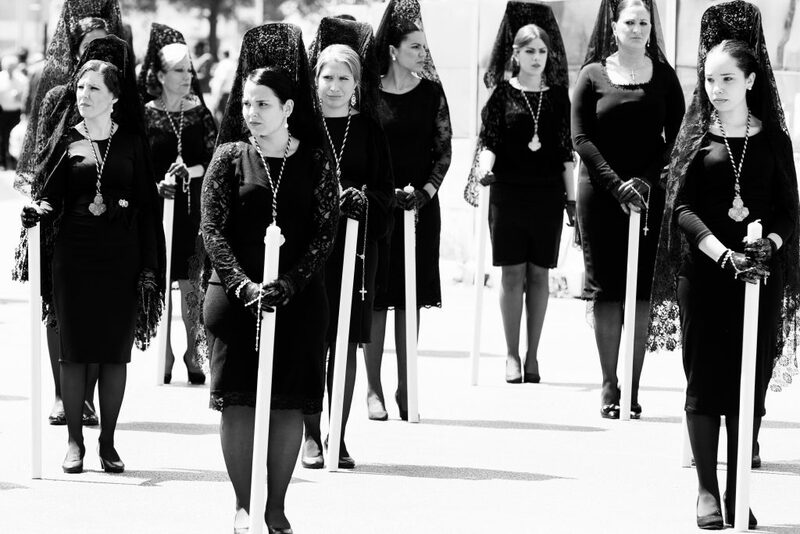 Women that walk with the thrones are usually dressed in a “mantilla”, a lace headpiece that is set in place with a “peineta” and other complements such as little combs or bobby pins. They also wear black dresses, black tights, blackshoes and black gloves, since they are mourning Christ’s death. For this year 2019, celebration dates are from 14th to 21st of April. It’s very important to know that this year the brotherhood group (an organism that coordinates them) has voted for a change in the usual path so, even if you have already seen this parade, this year the experience will be totally new: the new path will start at “Plaza de la Constitución” and will follow through the streets “Marqués de Larios”, “Martínez”, “Atarazanas”, “Torregorda”, “AlamedaPrincipal”, “Plaza de la Marina”, “Paseo del Parque” and “Molina Larios”, near the Cathedral. Usually it is on the main route where you can see better the processions, even if it’s crowded, you can always carve a spot for yourself. What we recommend is to get a spot either where the parade begins, from its Brotherhood House, or at its closing, where the throne goes back to the temple. Festivities start on Palm Sunday with the “Procesión de la Pollinica”, that is known for having a great childcourt. On Holy Wednesday, the most important brotherhoods have their processions, although it’s possible that the most spectacular day is Maundy Thursday, when the legionaries disembark and parade with Mena’s brotherhood. So you don’t miss a thing, it’s essential to get the official procession program, that we invite you to download from this page in Spanish. If you need additional information about itineraries and times, you can check it out here as well. On a previous post we talked about the delicious Malaga’s gastronomy, but of course we want to recommend you some places managed by brotherhood devotees, so your cultural immersion is full: you must go to the Entre Varales restaurant, with a typical menu with delicacies such as “pescaíto frito” (fried fish) or specialties such as the dish “Nuestra señora del Carmen”, although their most famous dish is Barbate’s red tuna. As a curiosity, salads are named after Málaga’s brotherhoods. 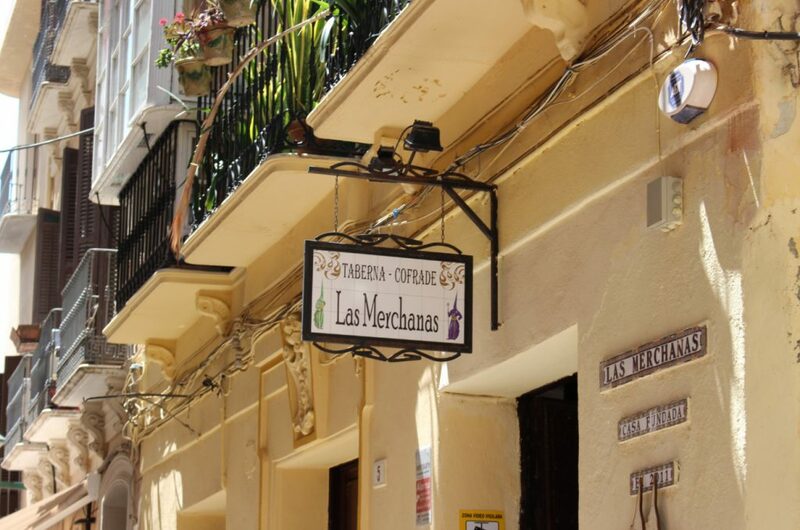 Las Merchanas is a brotherhood bar that serves traditional Málaga food, with dishes such as “Croquetas de la abuela Mari” (Grandma Mari’s croquettes, you can’t pass on these, as they have been awarded prizes), “flamenquines” and a great range of “montaditos” (a slice of bread with delicacies mounted on it). The whole bar’s decorations are based in objects that are usually worn or taken on the processions, and images typical of Málaga at Easter. Finally, we want to highlight the Mesón El Cofrade, that looks like a museum dedicated to Málaga’s Easter: it once you get through the door after walking down the pedestrian street, it has many pieces that represent the thrones used on the Easter. It stands out due to its good value for money. Its star dish, that has won a few competitions, is the “bacalao cofrade” (brother cod). And of course, you can’t miss their typical Holy Week desserts, such as chocolate and meringue “nazarenos”, or honey “torrijas”. If in the end you cannot come to Málaga to enjoy Easter, but you want to plan a trip for any other time, let us remind you that at our blog you can find recommended routes by car, some towns that need to be admired or some things you can’t miss if you’re travelling on a schedule. We’ll be waiting for you!